If your GE front load washer won’t spin or tumble this page will help. There are a number of things that can cause this problem. This page will walk you through the diagnostic process to find out what is causing this problem. The first thing to check when a GE front load washer won’t spin is the belt and pulley. Remove the back panel off the washer to access the belt and pulley. Check to see if the belt is worn or broken and if so, replace it. Sometimes the belt will work its way off the pulley. If this is the case the pulley will have to be replaced. What happens is the pulley will wear out and wobble on the shaft and a lot of times the belt will come off. If this is the case I suggest replacing the belt and the pulley. If the above does not reveal your problem, you will need to place the washer in the service mode to view the error codes and to run test modes. Follow these steps to enter the service mode. 2. Clear current cycles by pressing the power button. Make sure the screen is blank before attempting to enter the service mode. 3. Disconnect power to washer for at least 30 seconds. 4. Reconnect the power and within 30 seconds of reconnecting power complete the next step. 5. Press signal -delay start -signal - delay start. Note: Entering the service mode is a little different on models GFWN1000, GFAN1000,GFWN1100, and GFAN1100. To enter the service mode on these models press signal, extra rinse, signal and extra rinse. Press the same button sequence to exit the service mode. If you successfully enter the washer into the service mode, t01 will be displayed and the door will lock. Never disconnect the power to the washer while it is in the service mode. Doing so may result in a damaged control board. To exit the service mode press signal -delay start -signal - delay start. Once in the service mode, the first thing to do is to check for error codes. Rotate the knob until t02 is displayed then press start/pause to view the most recent error codes. Then press start/pause to rotate through each error code. If water flows into the washer slowly, the washer will pause and stay paused until you come along and reset the machine. This will often be just before the rinse cycle; therefore, the washer never has a chance to reach the final spin. If you are getting this error you will need to run the t08 and t09 test modes. First, exit the error code test mode by pressing power. To enter the hot water valve test mode, rotate the control knob until t08 is displayed in the control panel then press start/pause to enter the test mode. This is the hot water valve test mode. Once this test mode is entered, “hOt” will be displayed in the control panel and the hot water will start to run. Hot water will continue to run until the main water level is reached or you press power to exit the test mode. If the main water level is reached before the test mode is terminated, the washer will pump the water out and return to t08. Note that some GE front load washer models do not have this test mode. This can be a little confusing because you can rotate the knob until t08 is displayed; however, when you press start/pause you hear two beeps and the display continues to display t08. To enter the cold-water test mode, rotate the control knob until t09 is displayed in the control panel then press start/pause to enter the test mode. This is the cold-water valve test mode. Once this test mode is entered, “Cld” will be displayed in the control panel and the cold water will start to run. Cold water will continue to run until the main water level is reached or you press power to exit the test mode. If the main water level is reached before the test mode is terminated, the washer will pump the water out and return to t09. Note that some GE front load washer models do not have this test mode. This can be a little confusing because you can rotate the knob until t09 is displayed; however, when you press start/pause you hear two beeps and the display continues to display t09. Note that some of these washers do not have the t08 or the t09 test modes. If this is the case, you will need to exit the service mode and test the water valves manually. First, place the washer in a cycle using the cold tap water temperature setting and you should note how well water comes into the washer. Then place the washer in a cycle using the hot water temperature setting and you should note how well water enters the washer. If water flows slowly during either of the tests, first make sure the water at the wall is turned on fully. Then turn the water off and disconnect the hose at the washer. Get a bucket and run both the hot and the cold water into the bucket to make sure you have good water pressure coming to the machine. If not, there will be a strainer in the hose that is most likely clogged; clean it out and your problem will be repaired. If you have good pressure coming to the washer then you will need to replace the water valve on the washer. If your GE front load washer won’t spin or tumble you may have a problem with the inverter or motor. If this is the case, you will see a motor or inverter error code. 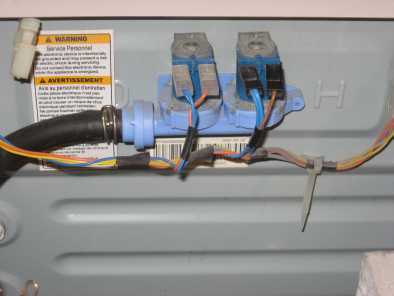 On these GE front load washer models these three errors are motor errors and can be caused by a bad inverter or motor. First, clear the code, exit the service mode and disconnect the power to the washer for at least 30 seconds. Don’t disconnect the power until you exit the service mode because it may damage the control. If the problem persists see the page below. On these GE front load washer models these are inverter errors and can be caused by a bad inverter or motor. First, clear the code, exit the service mode and disconnect the power to the washer for at least 30 seconds. Don’t disconnect the power until you exit the service mode because it may damage the control. If the problem persists see the page below.